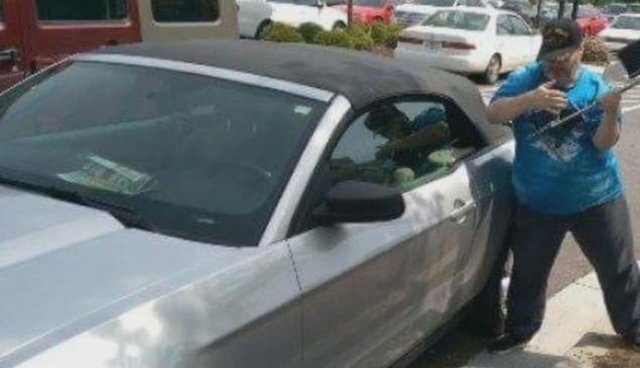 A small dog was rescued from a very dangerous situation after being left alone in a hot car - all thanks to the quick thinking of a passerby who smashed a window to free her. But instead of being rewarded for his selfless act, the hero of this story was hit with criminal charges. Michael Hammons, a veteran who served in Desert Storm, was among a group of shoppers who discovered the little pup alone and panting in an Athens, Georgia, parking lot on Saturday. It was about 86 degrees outside, but far hotter inside the car, so Hammons knew he had to do something. Hammons proceeded to break the car's driver side window for the sake of the trapped dog. "I've got PTSD, and I've seen enough death and destruction," Hammons told local news station WXIA-TV. "And I didn't want anything else to happen if I could prevent it." When the dog owner returned to the vehicle, however, she was less than grateful for what was done on her pet's behalf. She called the cops and insisted that Hammons be arrested. "We didn't want to charge him, but he told us he broke the windows and when you have a victim there saying she wants him charged, we had no other choice," Chief Deputy Lee Weems told MyFoxAtlanta.com. "I knew there'd be consequences, but it didn't matter. Glass, they make new glass every day, but they could never replace that dog." The dog owner, meanwhile, was cited for leaving her pet in the hot car in the first place.